Harlequin Ducks get their name from Harlequin; colorful, comic servant characters in the Italian theater form Commedia Dell'arte. The character is not unlike the juggler or the joker characters that appear in later forms of theater and comic books. It is argued that the harlequin character was inspired by the patched habit (coat) of Saint Francis of Assisi who is claimed to have been influenced by Sufis. Saint Francis is known as the patron saint of animals, birds and the environment. He was born into a wealthy family in 1181 and eventually lost his taste for worldly life and founded the Franciscan Order. He and his followers celebrated and venerated poverty. His love for animals and humility towards nature is recounted in numerous legends and folklore. "He believed that nature itself was the mirror of God. He called all creatures his 'brothers' and 'sisters', and even preached to the birds". "He preached to man and beast the universal ability and duty of all creatures to praise God and the duty of men to protect and enjoy nature as both the stewards of God's creation and as creatures ourselves". This message we need to take to heart. Especially in an age when we are driving ourselves into an environmental disaster. 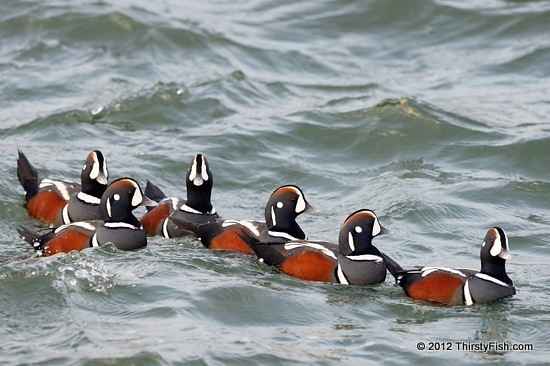 This paddling of Harlequin Ducks was photographed at the Barnegat Lighthouse State Park.